Bread of Life by Timothy R. Botts illustrates the words of the Lord Jesus, stating that He is the only way to satisfy the hunger of our souls. "I am the Bread of Life. No one who comes to Me will ever be hungry again." 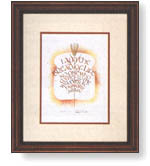 This print comes in a walnut frame with beaded lip and a cream mat. Bread of Life copyright © 2001 by Timothy R. Botts is prohibited from being copied.